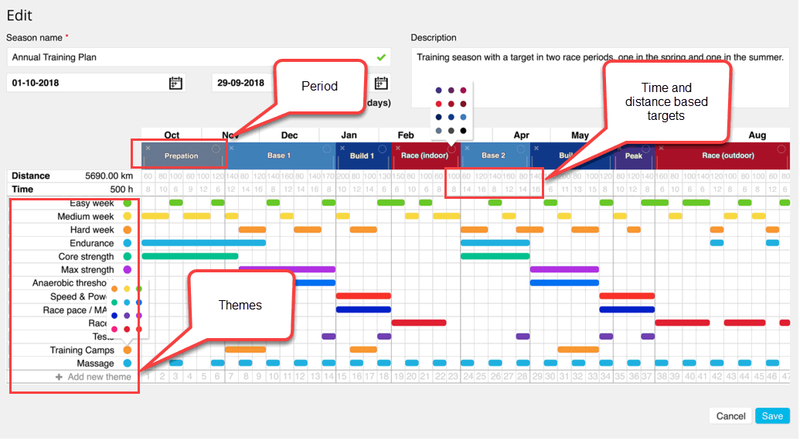 With Polar Flow Season Planner you can plan and customize the training season you want. The best way to learn it is to try it out and create a new season. You can edit the plan after you've created it. To get started, sign in to Flow web and navigate to Programs > Season Planner on the top of the page. Start by clicking the Create new season button. Give your season a name, define the lenght, and add a description if you want. Press Create season. 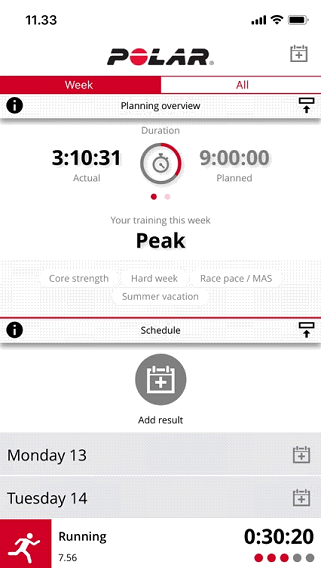 When the season opens on the screen, there's a summary bar on the top that will let you see the total amount of sessions, distance and duration you've done during the season. Also, manually added training sessions are taken into account. The season can be removed from the cog wheel in the upper right corner. You can make your changes to the Season timeline through the Edit button. Click on the period timeline to add a new period. Change the length of the period by dragging its borders. Change the color from the upper right corner and delete a period from the upper left corner. 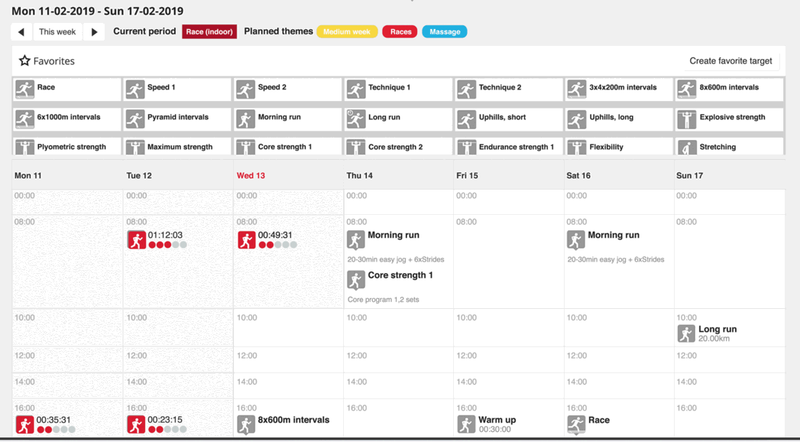 Click on a week to add a plan for that week based on the duration or distance of the training sessions. After the sessions, the actual tracked distance or duration will be shown. Click Add new and name it as you like. Place it by clicking on the week of your choice. Define the length of the theme by dragging with your mouse. Rearrange your themes by dragging and dropping and change the colors to your liking from the upper right corner. Creating training targets works similarly as before in Flow. Here's a link to the instructions at support.polar.com. Training targets are convenient when planning a training program – just drag and drop a target from favorites to your plan. Please note that dragging and dropping training targets is possible only in the Season Planner. Once the targets are in place they're synced to a supporting wrist unit automatically in the next synchronization. Please note that favorite routes and Strava live segments® cannot be added here. Throughout the season you can follow your planned versus realized training sessions and seasonal volumes on granular level. There's also an extensive set of stats such as season totals, weekly heart rate zone distribution and many more. You can also adjust the on-going season or make an entirely new training program. Old seasons stay in the system and you can view them later. Flow web service shows a comprehensive big picture of the whole season and Flow app provides a convenient weekly level follow-up. You can also drag and drop training targets to different dates and quickly add a training target to a specific date by clicking the plus icon next to preferred day. When adding a new training target, it now includes option to add favorite targets that have been saved in Polar Flow web.